As the 2015 election approaches the details of policy pronouncements become every more important. 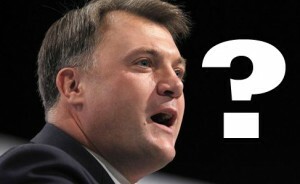 The notes below are intended to summarise the points in Ed Balls Annual Conference speech in 22 points. 2. real wages have fallen for 38 out of 39 months, unemployment is rising. Britain has lost its triple A credit rating and has been downgraded twice. The deficit is set to rise to £90bn by 2015. 8. 400,000 disabled people are threatened with the bedroom tax. 20. unblock £bns for investment in renewables, nuclear and clean gas/coal technology. The Green Investment Bank will get the powers it needs. We will legislate for a 2030 decarbonisation target. 22. consider pooling health and social care as a single service and will ask if we need separate costly management/bureaucracy for so many separate government departments, agencies, fire services and police forces. Posted in: Economy, Ideology, Labour. Some of it’s OK on the whole I think you may as well stay with the Tories to be honest, as he says the recovery has started, not that I would vote for the Tories myself. The cap on the disabled and the sick, and the unemployed seems if you lost your job because of the down turn no matter who you blame both Labour and the Tories are going to kick you a bit more. Affordable houses OK fine should help the squeezed middle class will do sod all for the young married couple on the min wage or the four or five million people labour let in or the polish people unless they are middle class, so council houses are out in Milibands Newer labour. It’s a toss of the coin really take a chance with labour who say nothing wrong with the banking bonus culture or the banking crimes or in fact the fat cats MP’s who got away with blue murder on expenses. But you dare to be born disabled or at nineteen twenty lose your legs in a Labour war, then sadly your fault and you going to get sod all. but you can dream of owning a nice house which is affordable. Never Labour the party of the squeezed middle which was Blair and Brown mantra and the hard working, the hard hard working. If your working class disabled sick or poor then sadly voting would be worthless.